I love it when I get to play with new products and see what I can do with them!! 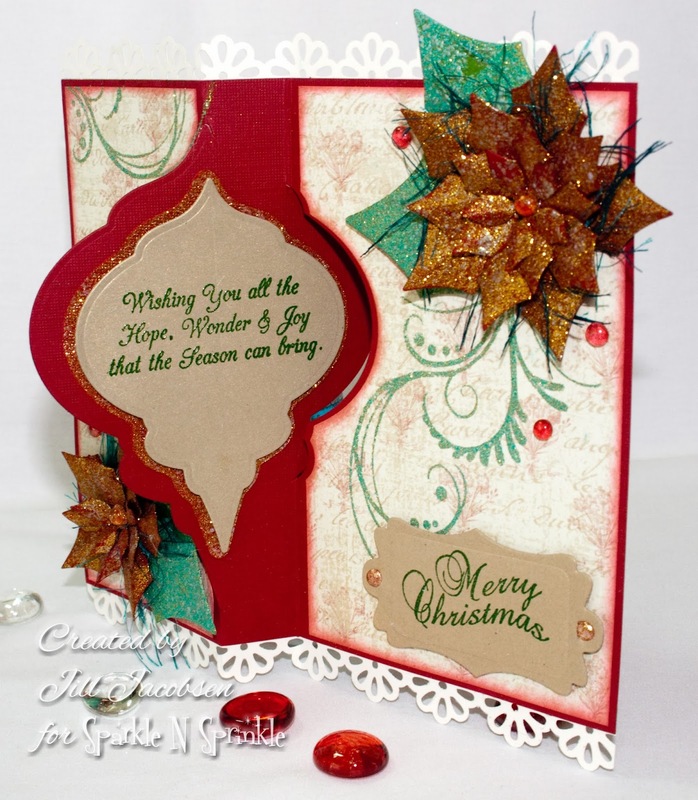 Sparkle N Sprinkle has new Christmas Marbled Embossing Powders and they are sooo pretty and sparkly!! This time there is a sparkle added to the mix!! 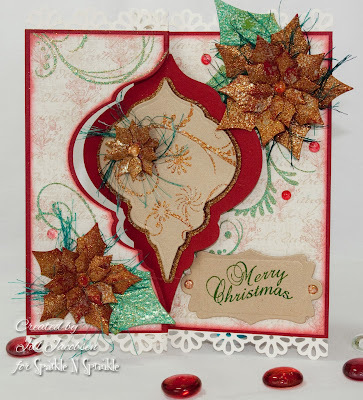 So I started with cutting out the ornament with a Gold Metallic cardstock and stamping the Flourish on it, embossing with the Red Marbled Christmas. Then it needed another layer of sparkle so I hand cut a slightly larger ornament and embossed the entire cardstock with the Red Marbled Christmas and layered it with dimensional tape. 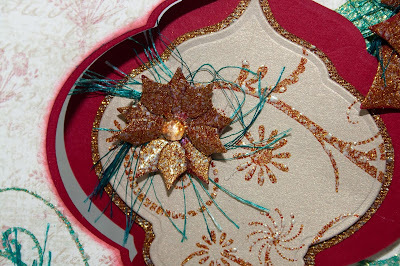 Then I decided to make the card a Swing Flip Flop with the die. It's not that complicated, just decide what size card you want, mine is a 6 x 6, then score two little marks top and bottom at 3 inches and line up the points of the die with them. Position the cardstock so the right side of the card is laying off the mat and the left side is in the sandwich to cut and run it through your machine. Then mark about 1 1/4" over and score two more lines, position your die back in place and this time reverse the paper in the sandwich. That will leave you with a center piece that is not cut and that is what makes the flip flop part. 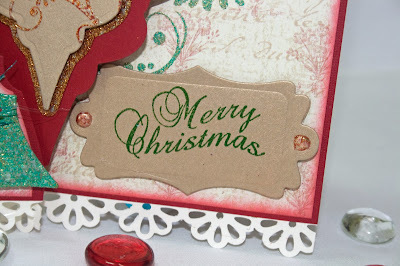 So then I stamped the pattern paper with the Flourishes also and embossed with Green Marbled Christmas. 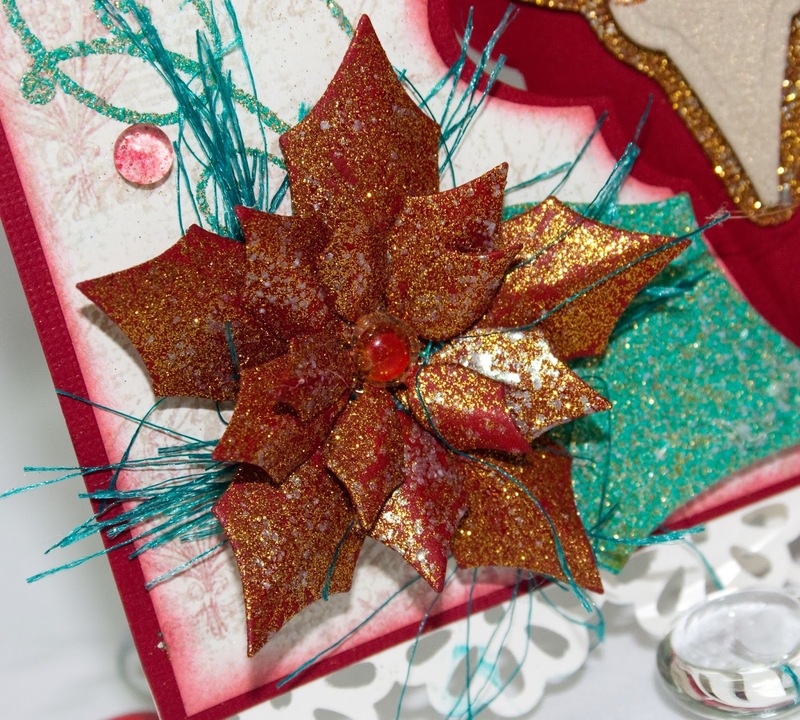 After I decided to put the Poinsettias on I saw they needed sparkled too so thought I would emboss the flowers with the Red Marbled also. Used a hot glue gun to layer the petals. The leaves are embossed with the Green. You can view more details on how I finished the card here at Sparkle N Sprinkle.